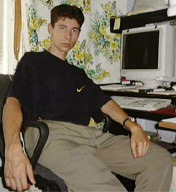 Sergey from Nikolaev was born in Simferopol in 1980. Now, he studies at the European university of the finance, information systems, management and business, and also works in sphere of the communications. Sergey is adherent of active recreation, loves to travel. Was in Moldova, Russia, Poland, Romania, Germanium and Yugoslavia, naturally, in Crimea. 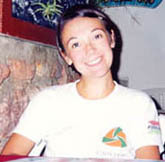 Oversea trips, in main, carries out due to links in international student's association AIESEC. Sergey's grandparents had Byelorussian - Russian - Polish an origin. The sole man, which in detail knew a history of a sort, after war has left in USA, and the tracks him there were lost. On words of Sergey, he would be happy, if with the help " Planet of Matusevich's " the question about his genealogy will be clarified. Alena from Novodnestrovsk (Chernovtsy area) has informed us, that her grandfather Bronislav A. Matusevich was born in April, 1907. Before war he lived in Sadgore (now Chernovtsy) where has ended seven classes of austrian-ugrian school. Bronislav served in the Polish Army as the cook. His father had the shoe workshop which later has transferred in hands of the son. Alena's great-grandfather except for Bronislav had another children, but their destinies, unfortunately, are unknown. As to Bronislav, he had from the first wife four children. Daughters have received names Victoria and Galina, the younger child have named Kazik. Other son tragically perished at work in shaft. Bronislav's first wife also perished. Alena's father, Vasily, was born February, 16, 1955. During war Bronislav Antonovich has lost one leg, but he did not make out group on physical inability, constantly hid all documents and spoke, that them have stolen in anything train. At the end of 80 to his wife arrived people from Canada, they searched for the grandfather, but she, for the unknown reason, has told, that nothing about him know. Alena has written to us, on " Matusevich's Planet", with hope that somebody will respond, will help to find out details of life of her ancestors. 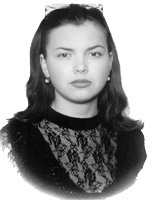 … In Shamraevka Matuseviches lived long since. Can be, my ancestors came together with first colonists from Volhynia, being rescueed from devastating tatar attacks. 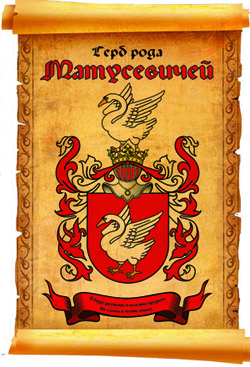 The last century the village belonged to Polish magnates Branitski…"
This fragment from Illarion Kirillovich Matusevich's book "The Post №26" to us was sent by his granddaughter Katerina. Katya was born and lives in Kiev. In the same place studies and works. Each year travels to Odessa on "Humorina" , likes to have a rest in Crimea, traces a vogue. Katya have a younger brother, he studies on preparatory courses in Agrarian academy.